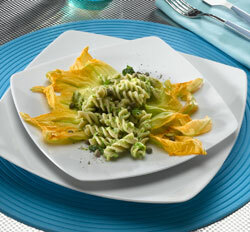 Use the bright yellow edible blooms of zucchini as a gourmet starter. Stuffed zucchini (courgette) flowers are something of a delicacy in French restaurants, but there’s no reason why you can’t serve them up in your own home. Serve them as a starter or as a main dish with pasta or salad. Pick your flowers just before cooking for optimum freshness. There are both male and female flowers on a zucchini plant. The female flower has a small swelling (the actual fruit) behind the base of the flower. The male flowers are on longer stalks. Typically it’s the male flowers that are used (they are larger), although either one is suitable. The female flower, with its fruit still attached, is a great option too. What to stuff them with? Herbs and soft cheese, such as ricotta or cream cheese, are ideal. Grate some lemon rind and mix with ricotta and fresh chopped herbs of your choice. You can add some grated parmesan too, if you wish. Place a spoonful of the mixture into the flower and twist the petals closed. Fry briefly in garlic butter. 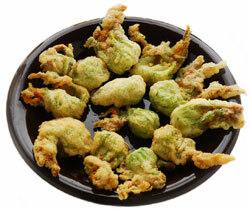 Alternatively, you can coat the stuffed flowers in batter and deep fry them.